CAPS United captain Hardlife Zvirekwi is set to get a prosthetic hand after emerging as one of the candidates to benefit from Nashua Zimbabwe's ambitious 3D prosthetic hand printing trial, which is underway in Harare, StandardSport can exclusively reveal. Zvirekwi's football career looked over when his hand was amputated from the wrist following an accident last year, but in a show of incredible willpower the 31-year-old former Warriors player recovered to feature for the Green Machine in the second half of the season after months of intensive treatment and rehabilitation. 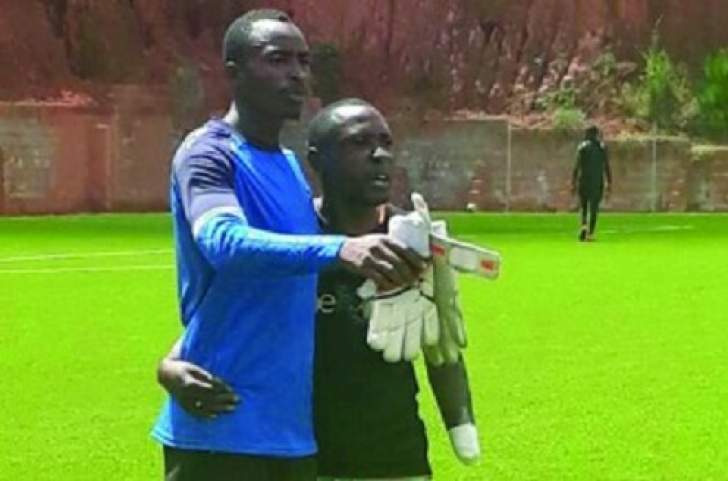 The story of Zvirekwi's return to competitive football following the tragedy captured international attention and inspired many like him with a number of global news organisations keenly following his comeback story. Now it has emerged that Zvirekwi might soon have a prosthetic hand if Nashua Zimbabwe's trial run is a success after he emerged as one of the candidates in need of a prosthetic hand who heeded the company's call to potential beneficiaries. Nashua Zimbabwe, a leading company in office automation tailored solutions in the country, announced their ambitious and benevolent trial project on their official Facebook page on Monday. It was on that platform that they invited four trial candidates to help with the project and on Friday they announced on the same platform that Zvirekwi was part of the shortlist. "And so our 3D prosthetic hand printing trial is underway! Not knowing who our applicants were, our team was surprised when CAPS United FC's very own Hardlife Zvirekwi came through the doors!" the company later announced. Since the player was involved in the horrific accident, there were efforts to mobilise funds to help him procure an artificial hand, but the initiatives seem to have died a natural death. Zvirekwi, who feels he still has a lot to offer for Caps United in their 2019 Premier Soccer League campaign after a solid comeback, confirmed the development to StandardSport. "I just volunteered to help them with their trial project and we will see what happens after that. I cannot say much about it because I may end up saying the wrong things, maybe they [Nashua] can give you the finer details. I am just happy to assist them with the project," he said. Nashua Zimbabwe hope the trial project will be a major success and open a new era in the company's quest to explore new technologies and make a difference in people's lives. "We are a leader in technology and we are always looking at things to explore as a company and this time we came up with the idea of the 3D prosthetic hand printing," Nashua Zimbabwe chief technical officer Wesley MacDade said in an interview with StandardSport yesterday. "It's [the project] only in the early stages and we managed to get trials candidates and one of them happens to be a professional footballer. We are just waiting for some of the kits from the US and once we are successful with the trial, we hope to benefit many other people." Zvirekwi, who was extensively featured in last month's edition of the top football magazine, FourFourTwo, revealed his desire to continue playing professional football and inspire the next generation. "Even with one hand, at the age of 31, I'm convinced I can play at the same level of football as I've always done. I have to soldier on to prove all of my doubters wrong. They will always be there, and that won't end with me. They were there before me and they will be there after me, but I've surprised them by being courageous," he said. The player, who made his international debut for Zimbabwe six years ago, said he was inspired by the retired Nigerian great Nwankwo Kanu who made a remarkable comeback after undergoing an emergency operation in November 1996 due to a heart defect. "I need to fight and try to inspire other people to do the same. That's the goal. I've been inspired by other athletes, too. Nwankwo Kanu had heart problems, but he overcame them to enjoy a successful career," Zvirekwi said. "I had my faith in God before the accident, and I still do after that. If you don't have faith, you don't have anything to believe in. You will never be able to overcome such situations without faith. I had to rely on my faith despite what happened to me."